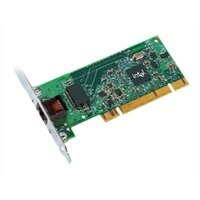 PRO 1000 GT PCI Desktop AdapterNow you can optimize system performance and increase end-user productivity for mainstream PC's with the Intel® PRO/1000 GT Desktop Adapter. Today's desktops are weighed down with high-bandwidth applications including voice, data, streaming video, video conferencing, and long-distance storage area networks. The environmentally friendly Intel® PRO/1000 GT Desktop Adapter's Gigabit bandwidth makes quick work of these network applications with power to spare. Now you can optimize system performance and increase end-user productivity for mainstream PC's with the Intel® PRO/1000 GT Desktop Adapter. Today's desktops are weighed down with high-bandwidth applications including voice, data, streaming video, video conferencing, and long-distance storage area networks. The environmentally friendly Intel® PRO/1000 GT Desktop Adapter's Gigabit bandwidth makes quick work of these network applications with power to spare.